Mohammed and his crew earn special praise. 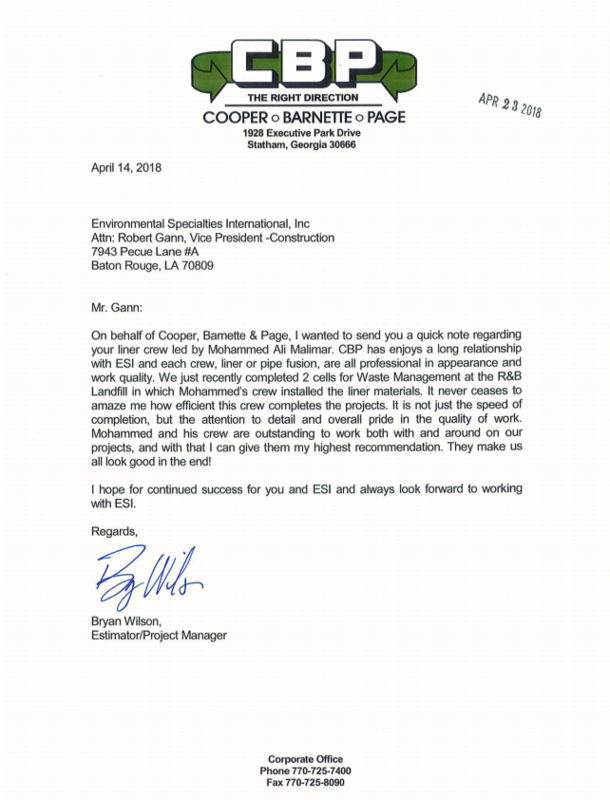 ESI loves to receive customer praise, and we are grateful for the latest from Bryan Wilson of Cooper Barnette Page (CBP). As Bryan writes in his letter of recommendation, Mohammed Ali Malimar and his crew earned special recognition for teamwork, professionalism, and quality of work shown during their work with CBP. ESI is in the people business, and we count on our team members to build long-lasting trust with our customers through safe work practices, quality, and performance. Mohammed and his crew exemplify this objective. We thank Mohammed and his crew for a job well done. We also thank Bryan and CBP for the business they have entrusted to us over the years. Like the work our team has done at CBP, we aim to do the same for your company. Environmental Specialties International, Inc. (ESI) is the nation’s largest geosynthetic liner installer for environmental containment applications. From coast to coast, border to border, we are trusted by the power, solid waste, energy exploration, mining, agri/aquaculture and other environmentally responsible industries. Since our founding in 2006, we have installed more than 55,000 acres of geosynthetic liners and lining systems that help protect our environment and enhance our quality of life. Contact ESI to put us to work!